Around 20 years ago, Bendis wrote and drew Fortune and Glory, a miniseries which chronicled his fledgling attempts to break into Hollywood as a screenwriter. A few years before that, Walker was writing and publishing a zine called Bad Azz Mofo, where he and others explored pop culture creations from the 1970s through to the present. A random encounter at a comic convention led to a friendship that’s in its second decade, and different paths took them through the worlds of independent publishing and mainstream comics writing. Despite the fact that both men eventually wound up working alongside each other at Marvel Comics—as well as teaching a class together at Portland State University in the US—Walker and Bendis never really collaborated until a few years ago. 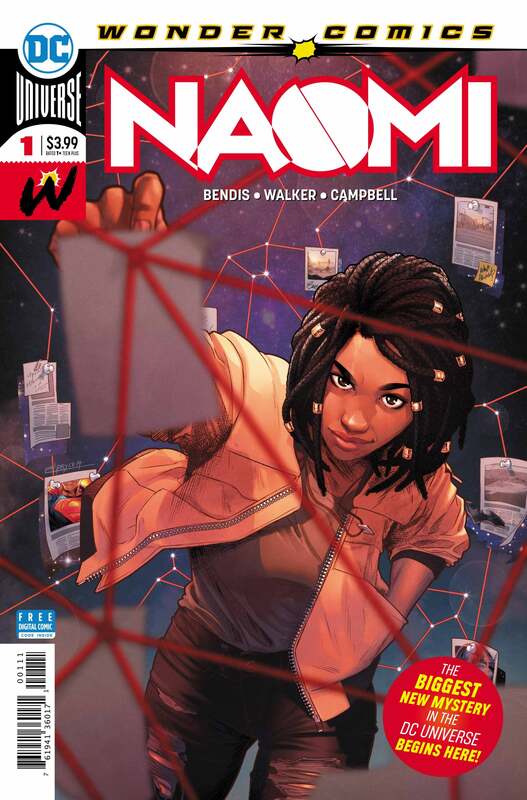 The fruit of their labours is Naomi, a new ongoing series from the youth-focused Wonder Comics imprint that Bendis is spearheading at DC Comics. It’s out this week, with art by Jamal Campbell and Josh Reed. The title character is a young black girl who becomes fixated on her possible connection to a secret superhero history after Superman thwarts would-be conqueror Mongul in her hometown. 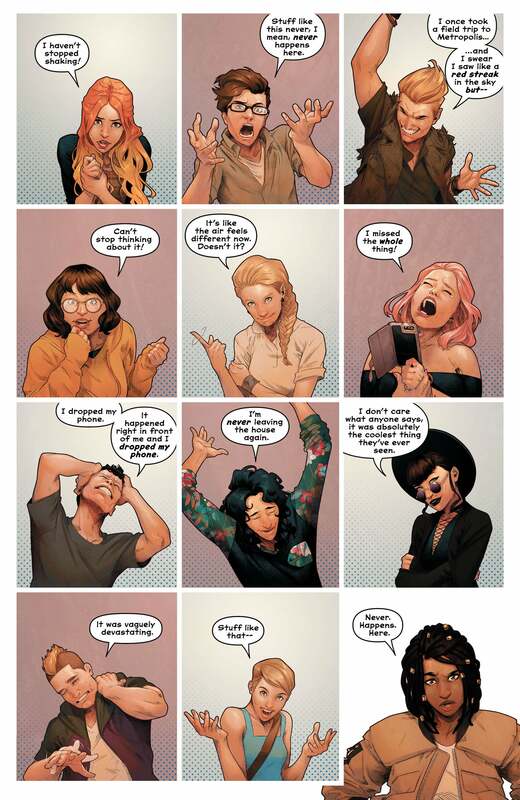 I spoke to Bendis and Walker over the phone last week to find out how they met, how their personal lives are informing Naomi, and who the series’ real MVP creator is. So far, your output at DC has a very different tonality from your work at Marvel. Is that an intentional shift? You’re saying “we,” which reminds me that I don’t think I know how you and David met and became friends, so let me hear your side of that. And we were—I’d say it was one of those slow burn friendships. Over the years we became closer. Originally, he would like, call me, “I’m doing this critic screening Wednesday night, come and talk about the movie” and I would run and come join him. Stuff like that. And then over the years we had dinners and he became a regular Friday night guest over here, and he just became part of our family. Then, after I’d been teaching for a while, I knew I needed a co-teacher and a co-perspective. After talking to David over the years at my house, I was like, “That’s a different perspective.” So I asked him to come teach with me, which surprised him by a little, but it was a really great partnership for the students. And then also, as we were sharing the classroom and co-lecturing about the hero’s journey, we kept looking at each other like, “We’re going to do this together, too.” It’s going to happen. And that was really the birth of Naomi. Just years of lecturing on what everyone should be doing, we realised we should be doing it as well. It’s been more than a decade at this point, right? How long have you been in Portland? Bendis: I’ve been in Portland [in the US state of Oregon] since 2001. I knew David, I think, about 15 years? But the other important part of that chapter is that David was enormously helpful during the birth of Miles Morales and during the years we were really building the mythology that became Spider-Verse. David was an enormous help and just a guiding force. Joe Quesada was another one, but, I’d say David Walker was up there, too. And I said to myself, “Next time we’re having this conversation, it’s going to be about an original character that we both have investment in,” and that’s where the process of Naomi started. Just so we can get both sides of the coin, how did you meet Brian? I’ve been thinking about your parallel career paths and where the intersections have and haven’t happened. I want to ask Brian—what was your reaction to David’s work like Nighthawk? So, let’s talk about Naomi. You guys have been friends and co-workers, at what point did the idea come up? Was it the character first or the germ of a thematic idea first? Was it the desire to work together? Okay, now, David—your side of that? 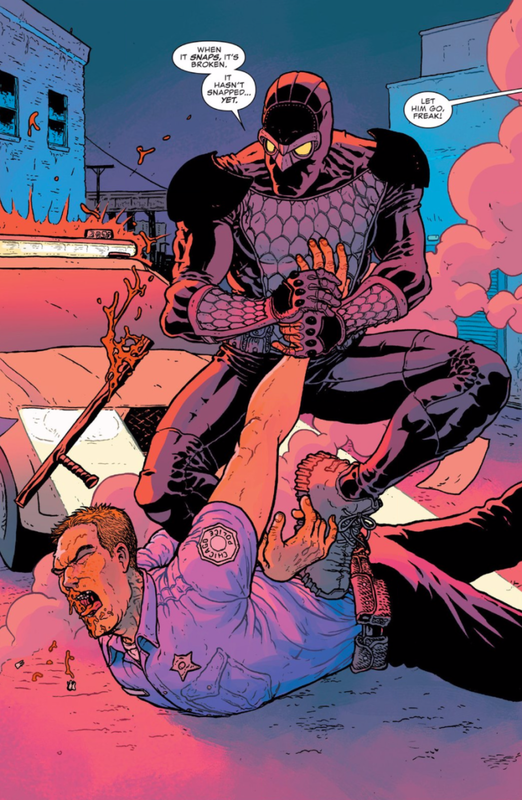 Nighthawk was filled with frustration and anger at the facts of what black people have to live through in America. In Bitter Root, you’re dealing with similar themes in a more metaphorical and fantastical way. Occupy Avengers was about how we all find our different modes of heroism. How is Naomi different from the stuff you’ve written before? I want to get into nuts and bolts…I’ve written a few comics now. I know how I write them is different than, say, how Ta-Nehisi [Coates] writes them. I can’t write them how he does. David, what are your scripts like? And what are Brian’s scripts like? And who does what in this process? I’m not concerned when people read and wonder, “Who do you think wrote that dialogue? You think that’s Bendis or Walker?” I’m just concerned with them going, “Wow, that’s a great scene. These characters are compelling.” And then to add to that, what Jamal is bringing from a visual standpoint is so amazing that Brian and I both…the character designs really clued us in that we struck gold. When the pages started coming in, we realised was that Jamal was bringing not only his A game, but his A+ game. And then we had to rethink some of the stuff we were writing. Brian, was there a scene you guys fought over in the first issue? Has the development of this series taken you to surprising places? Just today on Twitter, some young woman posted a picture of herself next to Jamal’s picture of Naomi. And she was like, “this is me.” And I was wowed by that. That any person can have that level of reaction and that level of connection, and the book isn’t even out yet. This is exactly what I wanted. This is what I think all of us need. And people who pooh-pooh these things and are the negative naysayers, they don’t realise how much they need it. And sometimes, they figure it out once they see it and sometimes they never figure it out. But, yeah, this is just a really positive experience. And, you know, like Brian was saying earlier, some of these experiences I’ve had have not been the best they possibly could have been. I’m coming out of 2018 and going into 2019 going into a lot more positive experiences. And just really blazing forward with, you know, “I’m going to get out of this what I put into this.” If something isn’t working for me, I need a way to find it to work, rather than just complain about it. Bendis: And I’m excited for you to see what it feels like to get more out of it than what you put into it. That’s an experience you just can’t fake. I will say, David is so right on the money about Jamal, because...I’ve had the genuinely joyful experience of being basically a stranger and going, “hey, let’s work together”—and suddenly realising you’re involved in a very special artist in a very special moment. It happened with Sara Pichelli, it happened with David Marquez…we were like, “Oh, you’re a nice person, let’s work together” and they were like, “Ohhhh… something’s happening here.” It’s very special. And that’s what’s happening with Jamal. At one point in the project, right around New York Comic-Con, me and David just looked at each other and said, “Now just clear the lane for Jamal. Let him sing.” Like, this is his moment. Every single page we get in, every single design we get in, you learn to take advantage of these moments and just include him in every creative decision that could be made that might inspire somebody. That has been really the deep-rooted thing that’s been going on behind the scenes for us. Sorry if this sounds terribly inside baseball—and I might not even include this—but Jamal did a variant for Rise of The Black Panther #1 that was amazing. Later on, the series editor Wil Moss and I were talking about a scene where T’Challa has to use a suit that he’s been testing. Wil asked me if I had any ideas what this suit should look like. I immediately thought of the design that Jamal did for the variant from #1. I said, “let’s use that.” It was too good to just have it be on a variant and not be in the actual storytelling. 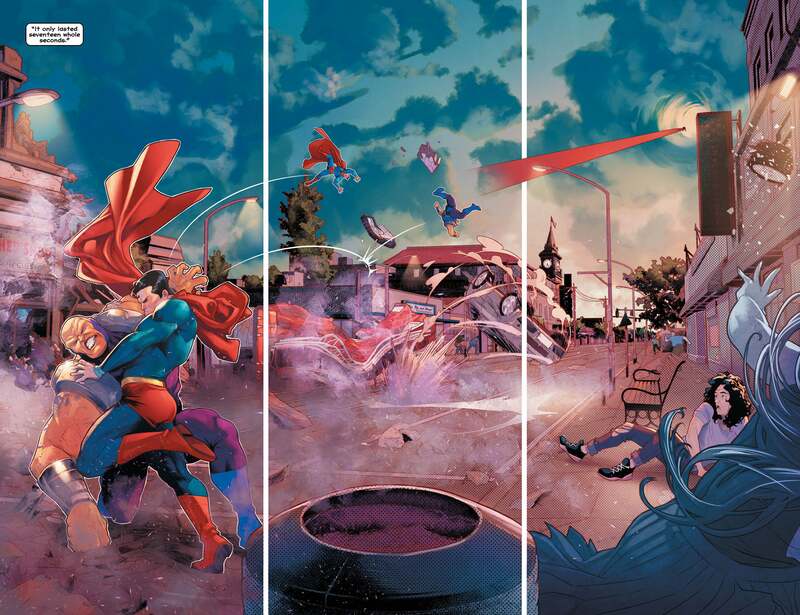 I’m so happy that we did that and that Paul Renaud did such a great job of using it in the interior pages. He nailed it. But, anyway, that’s my own brush with how Jamal is amazing.